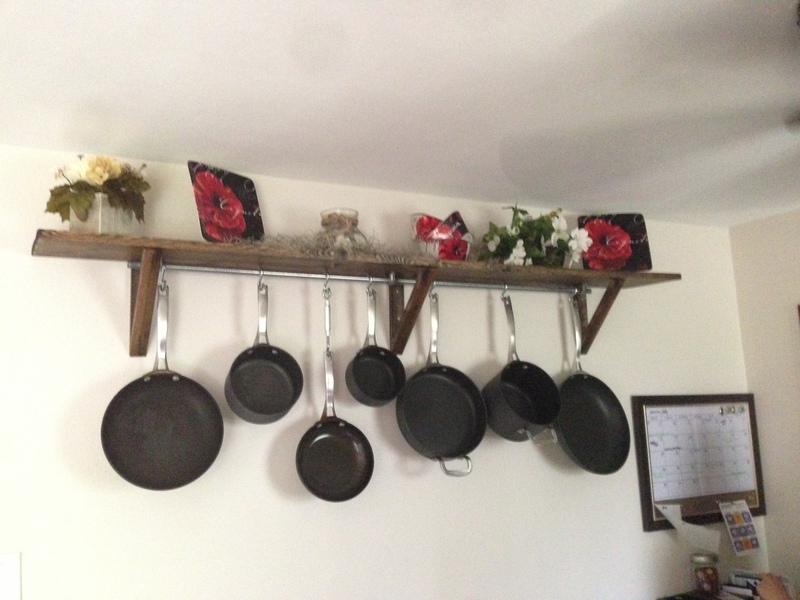 DIY Pot Rack and Organization Center – Nutrition.Health.Life. I am not going to lie…I am pretty proud of this post. I have been wanting a pot rack and organization area for quite a long time. The pots were nested in each other in the cabinets on the long wall. The “organization center” was basically on 1/4 of the counter on the long wall. The pots were annoying to dig out of the cabinet and I had to move the organization center stuff around to get to the counter space. Add a big blank wall to the picture, and I basically saw that entire area in need of a major makeover. I had been looking at some ideas for a pot rack for some time and the week after boards I decided to make it happen. I am super excited to show you all something that I built on my own. J was quite impressed with my handiness. 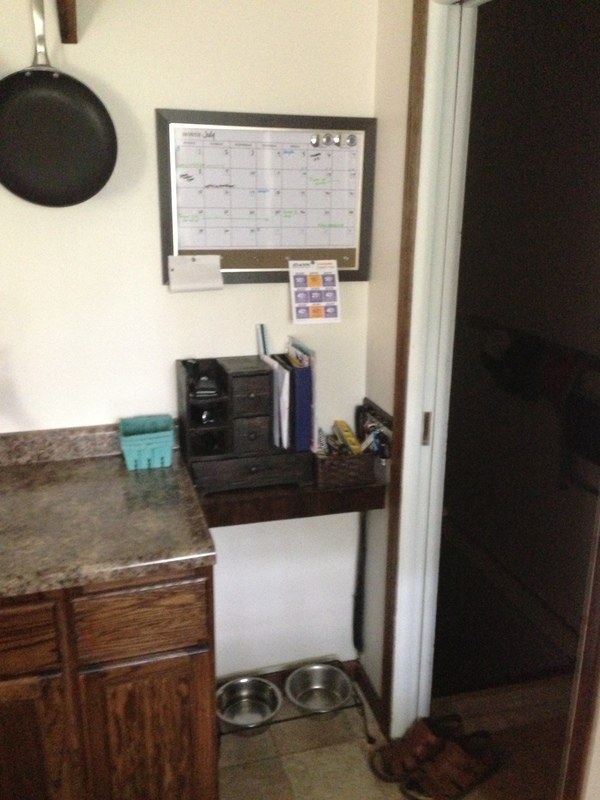 First, I built a floating shelf for over the dog dish. The leftover boards were a tad too short, so I left a space to the right. I told J that I would make it work, but he wasn’t a believer (the engineer in him likes balance and completeness). After a few days it came to me and I made the gap an area to hang keys and the dog leash. I picked up the dry-erase calendar/magnet/cork board for 90% off at Micheal’s Craft Store…Originally $45, now only $5 (can I even get a printed calendar for $5?!). The picture is fuzzy, but the wood basically matches perfectly and the cork board and magnet are exactly what I wanted. The wooden stand is something I picked up at Hobby Lobby for 75% off. Basically this entire organization center cost $30. And now for the glorious pot rack. This was also a cheap project. It is a pine 1x10x6′ board stained with the walnut stain we used for all the cabinets and trim in the house. Since pine is so porous, it only took 1 coat. The brackets are 1x2s, mostly leftovers. I used 1″ conduit for the pipe (J cut it to size and smoothed the ends) and some pipe brackets to hold it in place. I put S-hooks for all the pots and pans. The total cost was about $15, with S-hooks being the most expensive part. One pan was a little short and we wanted to balance things out, so I found some hardware (I’m sure it has a name but I don’t know it) that has an S-hook on one end and an eye on the other end. The S-hook attaches to the eye and voila, it is the right length. The end is adjustable, so we can change how low it hangs down. It works perfect. For the decor, I (again) wetn crazy at the clearance racks. The plates and bowls are part of our party dishes for when people over (which I got on 60% off at hobby lobby last winter). The flowers were all 80% off at Micheal’s for the end-of-the-season (because white and cream flowers have seasons?). The glass jar and tipped flower-pot were 75% off as well. If I had to guess, the decor was $25 total (including the plates and bowls). 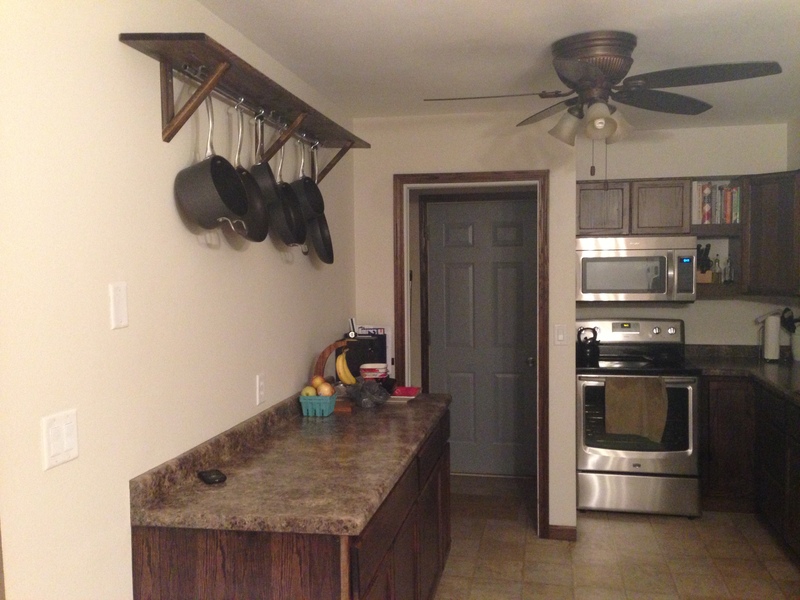 This entry was posted in Life and tagged DIY, kitchen. Bookmark the permalink.